Caldey Island (Welsh:Ynys Bŷr) is a small island 0.6 miles (1 km) off the coast near Tenby in Pembrokeshire, Wales. With a recorded history going back over 1,500 years, it is one of the holy islands of Britain. A number of traditions inherited from Celtic times are observed by the Cistercian monks of Caldey Abbey, the owners of the island. The island's population consists of about 40 permanent residents and a varying number of Cistercian monks, known as Trappists. The monks' predecessors migrated there from Belgium in the early 20th century, taking over from Anglican Benedictines who had bought the island in 1906 and built the extant monastery and abbey but later got into financial difficulties. Today, the monks of Caldey Abbey rely on tourism and making perfumes and chocolate. The usual access to the island is by small boat from Tenby, 2 1⁄2 miles (4 km) to the north. In the spring and summer, visitors are ferried to Caldey, not only to visit the sacred sanctuary but also to view the island's rich wildlife. Following a rat eradication programme, red squirrels were introduced in 2016. Alongside rare breed sheep and cattle, the island has a diverse bird and plant life. The island was named Ynys Bŷr after Saint Pyr, the sixth century saint, and Pyr is named as abbot of the monastery around the year 500 in the Life of St Samson. This Welsh name has remained in use since medieval times, but the Old Welsh name of the island before St Pyr's day is unknown. Like those of many Welsh islands, Caldey's English name (sometimes spelled Caldy) derives from the Vikings. Kald ey translates as "cold island", with the name appearing as 'Caldea' in the early 12th century, and Kaldey or Caldey by 1291. Three caves have been discovered on the island and excavated to unearth archaeological finds: Nanna's Cave, Potter's Cave (1950) and Ogof–yr-Ychen ("Ox cave", 1970). In Nanna's Cave, human bones and shells were first found in 1911 and excavations continued in three more stages until the 1970s. Potter's Cave was found in 1950 by a monk named James Van Nedervelde, and excavations, which continued until 1970, initially revealed stalagmites in which tools and animals were embedded. After removal of these finds, three human skeletons were found and carbon dated: two were dated to the Middle Stone Age and one to the Romano–British period. Also found were a few artefacts from the late Upper Paleolithic period. In Ogof–yr-Ychen, the bones of humans whose burials date between 7590BC and 5710BC were found. Stable isotope ratio tests revealed that they lived on marine food. A very few earlier neolithic bowls and shells have also been found in the caves. All the finds were carbon dated and have been preserved in the Abbey of Caldey Island or in Tenby Museum and Art Gallery. A Celtic monastery was first established on the island in the sixth century, and the island thrived during the Middle Ages. Following the Norman Conquest, Robert fitz Martin, Lord of Cemais, gave the island to his mother Geva. In the 12th century, a priory was established there by Tironensian monks as a daughter house of St. Dogmaels Abbey, and lasted to the Dissolution of the Monasteries in 1536. The current abbey was built in 1910 by Anglican Benedictine monks but financial problems beginning in 1925 led to the 1929 purchase of the property by Belgian Cistercians. It is considered to be the most complete example of the Arts and Crafts style in the country, and was the largest project of John Coates Carter. At the time of building, the abbey was called "the greatest phenomenon in the Anglican community at the present time". The roofs are of white roughcast with red tiling, and the abbey church has five side-windows and on the south a "tapering" tower with primitive crenellations. Caldey Island and Little Caldey Island have together formed an ecclesiastical district for as long as the locals can remember, with 20 Cistercian monks living at the monastery as of 2007[update]. 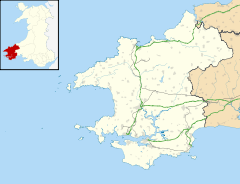 The Census Reports of the County of Pembroke record it as an ecclesiastical district for administrative purposes. Caldey Island is about 1.5 miles (2.4 km) long and 1 mile (1.6 km) in width at its widest. It has an area of 538 acres (2.18 km2) and its highest elevation is 197 feet (60 m). 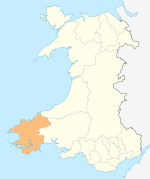 The island lies in Carmarthen Bay on the northern side of the Bristol Channel in the county of Pembrokeshire, a little over 2.5 miles (4 km) south of Tenby on the mainland of southwest Wales. It is separated from the mainland by Caldey Sound. A ferry service from Tenby goes to Caldey Island in the spring and summer months when the weather allows. Boats depart every half hour from the harbour at high tide, while at low tide they depart from Castle Beach. Caldey Island consists of two islands which are separated at high tide: Caldey Island and Little Caldey Island. Little Caldey Island is also known as St Margaret's Island or St Margaret's Isle, and lies off the north-western point of Caldey Island. It acquired its name in the 17th century, and is known for its seals and bird sanctuary. The island is mostly used for grazing. The average high and low temperatures for Caldey Island, along with wind speeds for each month of the year, are given in the following table. The absolute maximum temperature recorded is 33 °C (91 °F) in August and the absolute minimum recorded is −9 °C (16 °F) in February. Caldey Island is known for its flowers, many of which are rarely found in other areas of the United Kingdom. The island also has many species of birds that are prevalent in the summer months. The country's largest colony of cormorants is located at St Margaret's Island. Following a two-year rat eradication programme, red squirrels were introduced in 2016 and by 2018 were breeding successfully. The island's economic activity is supported by tourism and the sale of perfumes and chocolate. The main income comes from tourism. The monastery opened an internet shop in 2001 to sell products online. Their lavender perfume is said to be "simply the best lavender soliflore on earth" by the perfume critic Luca Turin. Caldey Island provides a spiritual retreat that accommodates up to 750 guests a year. The island has a functioning post office including a museum of the island's history. The island has its own postage stamps and its own monetary unit, the Dab. Tourist attractions on Caldey Island include the recently restored 13th-century church of St Illtyd, an ogham cross from the sixth century, a Norman chapel, and Caldey Abbey, completed in 1910. Caldey Lighthouse was built in 1828. The light was intended to help coastal traffic trading limestone and coal to mid- and North Wales but the light also helped long-distance and North American traffic identify the Bristol Channel and avoid confusion with the English Channel. The lighthouse is a squat, round, brick-lined limestone tower of 17 m (56 ft), with walls 0.9 m (3 ft) thick at the base and 2 ft 6 in (0.76 m) thick at the top. The light stands 64 m (210 ft) above high-water mark. The lighthouse was automated in 1929. The lighthouse keeper's cottages that flank the lighthouse are two-storey, with hipped roofs, octagonal chimneys and a one-storey linking corridor. The cottages were built around 1868–70 by T.C. Harvey. The north side of Caldey Island is made up of grey limestone, a desirable building material. The 19th century seems to have been the height of limestone quarrying on the island; some of the limestone was taken to the Annery kiln in the district of Torridge in north Devon for processing. The island issues its own postage stamps and has its own currency called the Dab, referring to a small fish species which occurs locally. There is a colonial-style tea shop on the green, and an underground reservoir near the lighthouse, supplied by a spring. This provides water to the gardens and the people. For handling emergencies, the island has a landrover which is shared between the Fire Service, Coastguard and Police, plus two fire engines. The island has a regular firefighting unit, a duty which used to be performed by the monks. The last reported major fire on the island was in 1940, when the monastery was damaged. In December 2012, six firefighters were brought by boat from Tenby to douse a small fire. ^ "Community population 2011". Retrieved 20 April 2011. ^ Hastings 2000, p. 64. ^ "Caldey Island". Caldey Island.co.uk. Retrieved 5 May 2013. ^ a b c "Caldey Island monks and residents get new 999 vehicle". BBC News. Retrieved 5 June 2013. ^ a b c "Caldey Island". Encyclopædia Britannica. Retrieved 6 June 2013. ^ Christopher Howells (March 2011). Caldey Island: The Story of a Holy Island. Graffeg. ISBN 978-1-905582-14-3. Retrieved 5 June 2013. ^ Royal 1977, p. 37. ^ Thomas, Charles. "Lundy's Lost Name (Island Studies (1997))" (PDF). Lundy.Org. ^ Manwaring 2008, p. 71. ^ a b c Burrow 2003, p. 237. ^ a b Burrow 2003, p. 56. ^ Burrow 2003, p. 21. ^ a b Williams 2001, p. 294. ^ a b "Caldey Island Pembrokeshire Wales". Caldey-island.co.uk. Retrieved 5 May 2013. ^ "Cistercian Way - Caldey Island". Archived from the original on 14 July 2014. Retrieved 7 July 2014. ^ "Caldey (Priory)". Monastic Wales. Retrieved 23 April 2015. ^ a b c HeathMichell 2006, p. 53. ^ a b c Atkinson & Wilson 2007, p. 167. ^ Royal 1977, p. 35. ^ Royal 1977, pp. 36 & 37. ^ a b c "Local Weather: Caldey Island Climate History". Myweather2.com. Retrieved 5 June 2013. ^ a b Huntington 1908, p. 323. ^ "British Wildlife Centre – Red squirrel release". Inside Ecology. 27 October 2017. Retrieved 1 January 2018. ^ Paul Evans (7 July 2018). "Red squirrel success story on Caldey Island". Tenby Observer. Retrieved 1 January 2018. ^ "Monks get internet shopping habit". BBC News. BBC. 3 June 2013. Retrieved 3 June 2013. ^ "Perfumes: The Guide by Luca Turin and Tania Sanchez, David Sexton". London Evening Standard. Retrieved 3 June 2013. ^ "Caldey Island Post Office, Wales. c 1950". Flickr. November 23, 2009. Retrieved 3 June 2013. ^ "Major restoration project for 13th century Caldey Island church". Western Telegraph. 7 July 2014. Retrieved 7 July 2014. ^ "Caldey Island – Visit Me in Wales". Wales.me. Archived from the original on 12 December 2013. Retrieved 3 June 2013. ^ "Caldey Island". Charles Wilmott - M0OXO. Retrieved 3 June 2013. ^ HeathMichell 2006, pp. 53–56. Atkinson, David; Wilson, Neil (2007). Wales. Lonely Planet. ISBN 978-1-74104-538-3. Burrow, Stephen (2003). Catalogue of the Mesolithic and Neolithic Collections at the National Museums and Galleries of Wales. National Museum Wales. ISBN 978-0-7200-0516-5. Hastings, Adrian (2000). A World History of Christianity. Wm. B. Eerdmans Publishing. ISBN 978-0-8028-4875-8. Heath, Robin F.; Michell, John F. (2006). The Lost Science of Measuring the Earth: Discovering the Sacred Geometry of the Ancients. Adventures Unlimited Press. ISBN 978-1-931882-50-7. Huntington, Father (1908). "The Benedictine Revival in the Church of England II: The Benedictines of Caldey Island". The Churchman: 323. Manwaring, Kevan (2008). Lost islands: inventing Avalon, destroying Eden. Heart of Albion. ISBN 978-1-905646-07-4. Royal, Commission on the Ancient and Historical Monuments of Wales (1977). An Inventory of the Ancient Monuments of Wales and Monmouthshire: VII - County of Pembroke. HMSO. OCLC 220312341. Williams, David H. (2001). The Welsh Cistercians: Written to Commemorate the Centenary of the Death of Stephen William Williams (1837-1899), the Father of Cistercian Archaeology in Wales. Gracewing Publishing. ISBN 978-0-85244-354-5. Wikimedia Commons has media related to Caldey Island. This page was last edited on 7 February 2019, at 10:42 (UTC).